What kind of bird is she? Macaws are in the parrot family. No. Blue and Gold Macaws are not endangered. Claire came from a breeder in Arizona. However, her species is native to the rain forests of Central and South America. They have also been introduced into the wild as far north as South Florida. Parrots living in captivity in the 2000’s are only 1 to 2 generations from the wild. Claire’s parents or grandparents may have been free to fly in the rain forest. Parrot trade regulations are improving to ensure that wild birds remain wild. Now that parrots are in our homes, it is our responsibility to care for them. How long will she live? Macaws in captivity live up to 80 years. In the wild, they may live 60 years. The life span of parrots correlated to their size. A tiny budgerigar may live in captivity only 8 years. According to her leg band, Claire hatched in 2004. How long have you had her? Claire came to live with me on May 7, 2013. YES. Large macaws are known to have a bite pressure of 500-700 pounds per square inch. As her mother, I would say that Claire’s is about 350 pounds per square inch. That is at full force. She breaks open nuts in the shell every morning for breakfast. When she is scared or angry, her bite can feel like it’s dislocating bones in your hand, leaving torn skin and bruising. However, she can regulate her bite depending on the person and the message she is trying to send. Sometimes she’s protecting our relationship or giving a warning of danger, other times it’s insistence on wanting to do something, and sometimes it is “stop doing that, you’re bothering me.” There is always a reason. Claire’s wings are clipped because she can fly. A wing feather clip is sort of like a haircut. It trims her flight feathers while preserving her landing feathers so that she cannot ascend, but she can glide to a safe landing. I know that Claire can fly because during the first few days in my home, she became scared and flew off my balcony. I didn’t know that walking up behind her was scary or that she was perched too close to the rail. She was very majestic in flight and landed in a palm tree close by, but slipped and fell from it into a planter box, where we were able to reach her. We were very lucky and learned a lot that day! Yes. In addition to their heightened awareness and natural instincts, macaws have the mental capacity of a 3-5 year old human child. Only they never grow up! Their unique gifts enable them to live a long life. Claire’s natural call is very loud. It is almost like a high-pitched roar that rattles the windows and your ear drums. When she senses imminent danger, it becomes louder, more guttural and repetitive. A macaw’s scream is 100+ decibels. 105 decibels is considered damaging to the human ear. The loudest parrot recorded is the Moluccan Cockatoo, which screams at 135 decibels. These loud voices are important for communicating with the flock through the rain forest canopy, as the birds fly up to 500 miles per day in search for food. 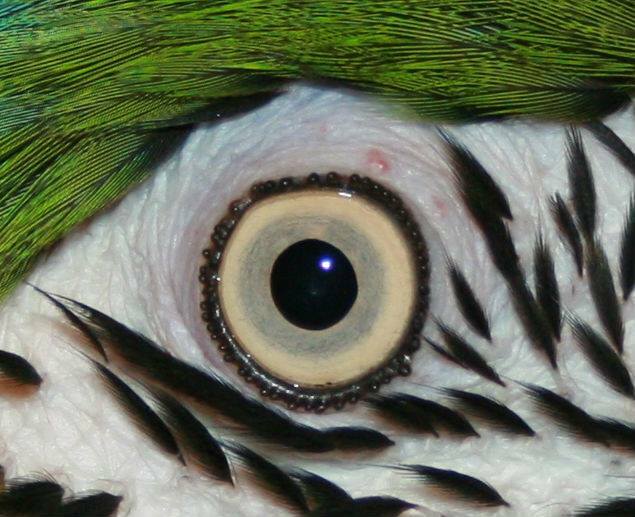 Macaws can see almost 360 degrees because they can rotate their eyes on either side of a narrow skull. They can choose which eye to see from in identifying predators from a distance, including the Harpy Eagle. Additionally, the spectrum of color they can see includes ultraviolet, which is believed to help them identify gender for mating. With their spectacular vision, macaws also have a sense of beauty. 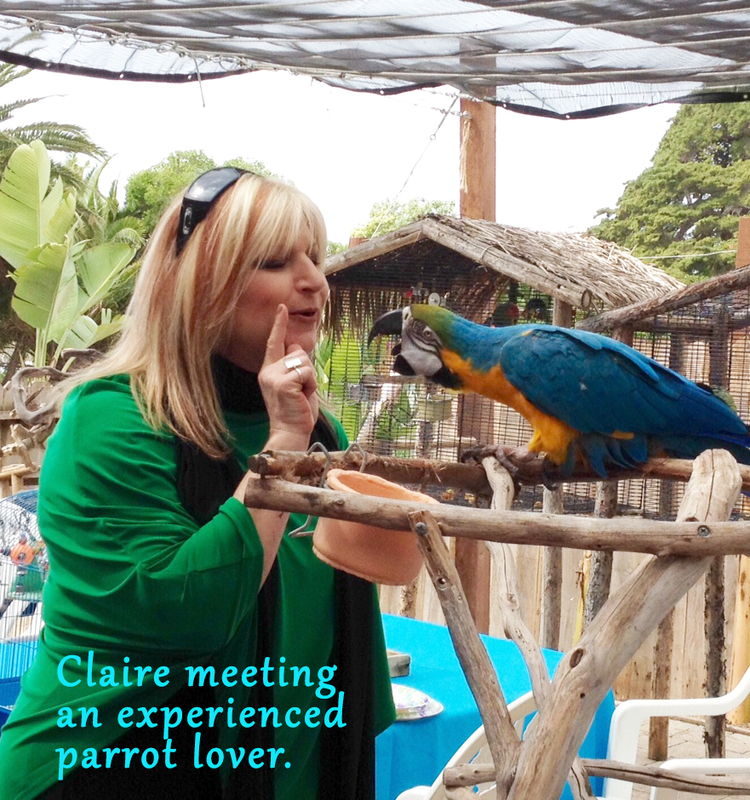 Claire experiences happiness in beautiful surroundings whether it be a garden, tropical setting, shoreline or fancy hotel. She expresses happiness by leaning forward wide-eyed with her mouth open, dancing and sweet chirping sounds. Sometimes she will simply start preening. Her beak is so big. Is it too big? Does it scare you? 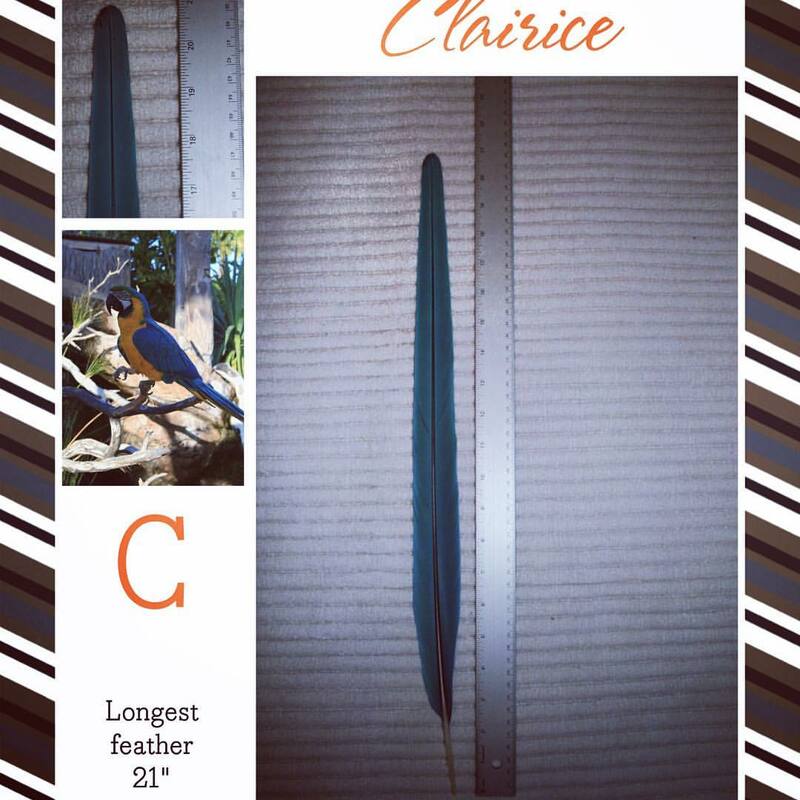 Claire’s beak is just the right size for her species. It grows like a nail. A beak that is too big curves under the lower mandible toward the crop (throat area). It might be very thick or very thin. It may also be flaky beyond normal growth. These types of abnormalities are caused by malnourishment. Claire cracks nuts in the shell every morning to condition her beak. I also apply coconut oil if her beak appears dry. The upper part of the beak is used for picking through food sources, pulling and climbing. The inside curve of the beak not only holds food in place for grinding, it also provides a serrated surface and is the location of the taste buds. Although intimidating, unless a macaw lunges and pulls, the upper mandible bears little risk for injury. The lower mandible is driven by jaw muscle that delivers pressure in upwards of 350 pounds per square inch. It is the force behind nut cracking, peeling, grinding and biting. What does she say? Does she mimic you? Claire does not mimic. She learns the meaning of words in various contexts. For example, she can say “hot” and she knows what it looks like , what it smells like and what it feels like. Overall, she has a small vocabulary that she uses appropriately, along with many human sounds, bites, body movements and looks she uses to communicate. Claire says hello in countless voices and intonations, she giggles, holds hands, blows kisses and whispers. She is constantly communicating. Claire only talks when she feels comfortable and safe. She loves attention, being outside and around lots of people. Macaws are flock birds, so they have an intrinsic need to be accompanied at all times, or at least have confidence in the whereabouts of the flock members (bird, human, cat, dog, etc.). However, she does not usually talk in front of strangers. Claire is approx. 32 inches from head to the tip of her tail and she weighs approx. 2 pounds. She is petite for her species. Although, the difference in size and weight may only be 1 inch to a half pound. Hyacinth Macaws are the largest species of parrots growing up to 39.5 inches and 3.75 pounds. Hyacinth Macaws are endangered. How much does a macaw cost? Blue and Gold Macaws run $1,200-$2,000 in the US. However, displaced and unwanted parrots are an epidemic. Because of their unique qualities, personalities and lifespan, they require a substantial commitment of time, patience and flexibility. 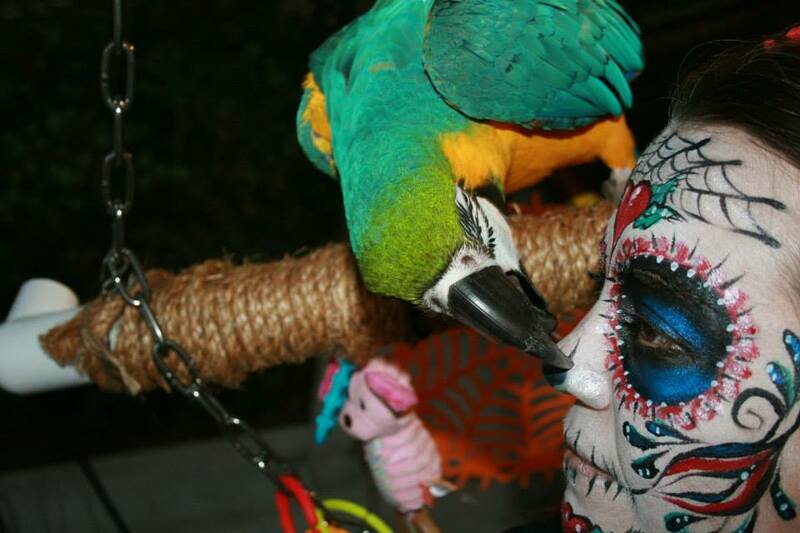 Although living domestically, parrots are not domesticated. If you are serious about committing your life to a wild animal in your home, adopt. Don’t shop. Sanctuaries and rescue centers are overwhelmed nationwide. 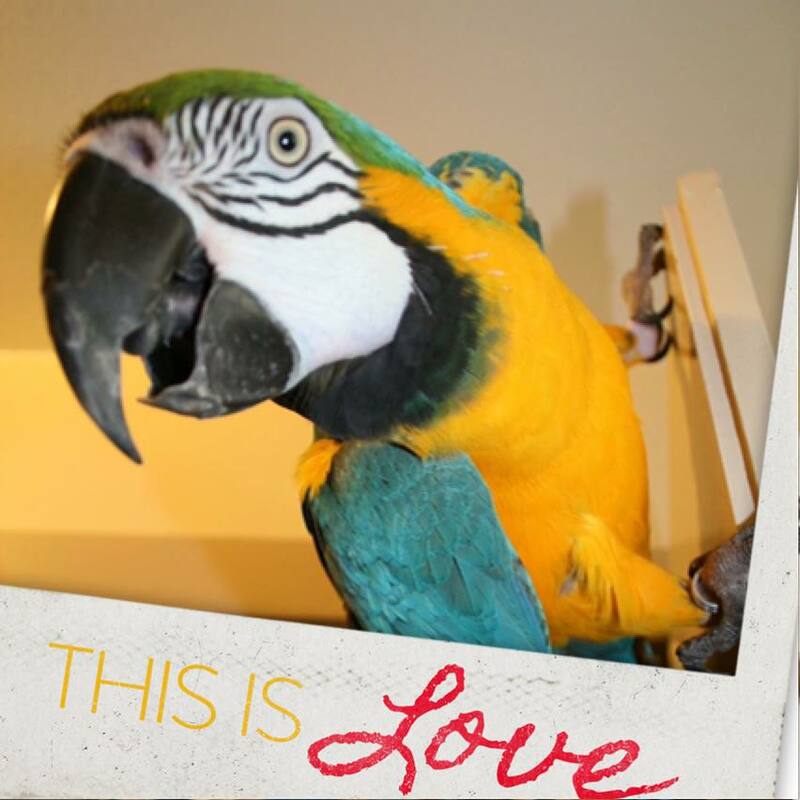 The cost to maintain one bird may be minimal, but the cost to maintain 40-100+ exotic parrots with health and behavioral issues due to longevity and neglect requires funding and resources. Be part of the solution.